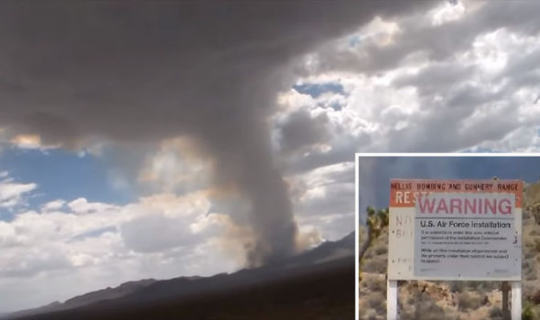 The pair, called Jimmy and Jackie, drove through the Nevada desert to the base that the US government only confirmed existed in 2013, despite being one of the country’s worst kept secrets, and spotted the smoke while approaching from Groom Road. 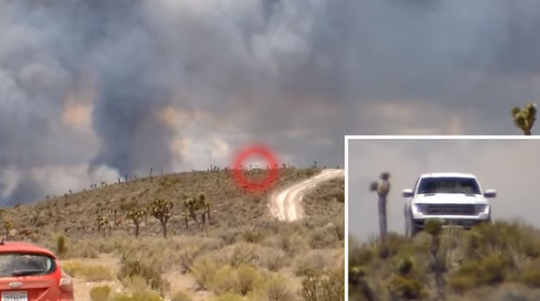 When they reached the main gate, which has warning signs not to cross, there was another group of four people watching the smoke who were being monitored by a white security jeep parked up on a hill. Some conspiracy theorists claim the authorities conceal evidence of aliens visiting Earth from the public within the base. It has been claimed a “flying saucer complete with aliens” said to have crashed near Roswell, New Mexico, in 1947 was taken and stored there for examination. Some suggest they try to reverse engineer alien space craft there, but more grounded researchers claim it is just a testing site for new aircraft technologies.